This is the closing installment of our 3-part series on how the CWI Pre-Seminar offers unique benefits for specific groups of welding professionals. 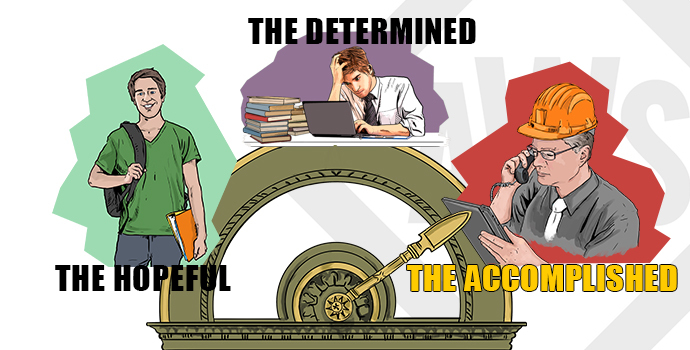 Today we focus on “The Accomplished”, which describes newly-minted and lifelong CWIs alike. If you missed any of the previous installments in the series, check out The Hopefuls and The Determined, geared toward those taking their first crack or second shot at the CWI exam. If you’ve kept up with our blogs over the last few weeks, you know that AWS recently fine-tuned the online CWI Pre-Seminar to better assist those looking to become Certified Welding Inspectors. Now, considering how much of an effort we’ve made to emphasize the value of the Pre-Seminar for prospective CWIs, (and the fact that we call it a Pre-Seminar), it’s fair to assume that none of this matters if you’re already a CWI right? Let’s be clear: Earning your CWI is a big deal, and a significant accomplishment. However, we believe the designation of “The Accomplished” encapsulates your professional achievements thus far. Perhaps more than the bulk of welding industry professionals, it’s crucial that CWIs never stop learning. In fact, in order to maintain your certification, it’s actually required! While that may feel like needless hoop-jumping, there’s a reason for it. What’s more, AWS offers a bevy of products and services that can help you achieve the ultimate double-whammy: broaden your skillset and knowledge base AND fulfill the requirements for keeping your CWI credentials current. We’ll discuss your options in just a moment, but let’s begin by taking a quick look at how the CWI renewal and recertification process works. Certification becomes effective on the first day of the month following the date of examination. On that same month and day, expiration occurs three years later. There you go: your credentials need to be renewed every three years. That’s less frequent than the FABTECH expo (every year), but more frequent than the revision cycle for AWS D1.1 (five years), senatorial elections in your state (six years), Halley’s comet whizzing by Earth (74-79 years), and the US Men’s National Soccer Team winning the World Cup (still waiting). How much continuing education, you may ask? At least 80 hours, 20 of which must be accrued during the three-year period leading up to your re-certification. So now that you know the basics, let’s talk about your options for re-certifying without breaking a sweat. As we’ve done in previous blogs, we discuss each option separately, so feel free to skim through and find the scenario that applies to you. However, for a more complete understanding of what might work best for you, we’d recommend reading each section in full. WPS/PQR Explained – Covers the basics of two acronyms most of us have managed to avoid so far: WPS (Welding Procedure Specifications) and PQR (Procedure Qualification Record). As per AWS B5.1, at least 30% of the questions on Part B of the CWI exam fall under the “Procedure and Welder Qualification” category, and at least 10% cover “Utilization of Specifications and Drawings”. Food for thought. Destructive Testing – A detailed look at mechanical properties and test methods. B5.1 tells us that at least 10% of Part B encompasses “Mechanical Test and Properties”. D1.1 or API 1104 Online Code Clinics – Instructor-led video courses focused on how to navigate, utilize, and extract relevant information from the D1.1 and API 1104 codebooks, respectively. Since the codebook endorsement must be any approved codebook other than the one used to earn your CWI credentials, you can simply choose the code you didn’t test to initially. It’s also important to note that since Part B makes considerable use of the Book of Specifications, knowing how to navigate a codebook may prove useful in this regard. DON’T WAIT UNTIL THE LAST MINUTE TO GET YOUR 80 PDHs! You don’t want to be the person who puts their credentials at risk because you couldn’t rack up two weeks of training over the course of nearly a decade. PDHs may be earned by participating in any classroom, correspondence, or distance learning in one or more subject areas listed in AWS B5.1, Specification for the Qualification of Welding Inspectors, Table 1. If you haven’t looked at Table 1, now is a good time. Table 1 consists of a detailed list of topics and subject areas that a welding inspector must be knowledgeable on, and skills that they must display competency in. The exhaustive nature of this list means that you can seek out training in almost any welding inspection-related topic and have it count toward your 80-hour goal. Another item of note is that the text in Clause 16.5.1 isolates three distinct learning settings. Let’s key in on two of them: classroom learning and distance learning. The nature of these two approaches is quite disparate, but either one can be effective. Luckily, AWS offers education and training in both arenas, so you can confidently re-certify regardless of your personal preference. Classroom Learning – If you prefer a more traditional classroom setting, can take a week off from work, and see the benefit in learning in the company of other tenured CWIs, then the instructor-led CWI 9-Year Recertification seminar might be the ticket for you. In addition to hands-on training and getting to pick the brains of fellow welding inspectors, the 9-Year Recertification seminar doesn’t require any form of testing. That’s a plus, no matter how you slice it. Distance (Online) Learning – If time off is hard to come by, you aren’t able to travel, or the idea of modular, interactive learning appeals to you, then AWS’ online offerings are seriously worth considering. If you review the AWS Learning course listing, you’ll find that every course covers one or more of the subject areas listed in Table 1. As far as the online courses go, they can be purchased individually, but that can quickly end up being cost-prohibitive. Alas, that brings us to the oft-discussed CWI Pre-Seminar. We feel it’s important to stress that despite its name, the CWI Pre-Seminar can benefit those who are already CWIs! As we mentioned earlier, it’s the responsibility of a CWI to stay up-to-date, keep their skills sharp, and never stop learning. To that end, the Pre-Seminar includes 10 online courses that cover a wide range of topics and concepts that directly correlate with the CWI Body of Knowledge. All in, you’re looking at 84 hours of instruction, allowing you to broaden your knowledge base AND meet the requirements for recertification on your own schedule. For the last month or so, we’ve been offering the CWI Pre-Seminar at a 40% discount. That special promotion ends today, July 6th. Well, it was supposed to end today. The powers that be have decided to continue offering the CWI Pre-Seminar at the special price, but what they haven’t decided is for how long. So, whether you’re a CWI simply looking to build on what you already know, or need to think about re-certifying with your 9th year approaching, we think it’s a great time to make it happen. And remember, no matter what steps you take to improve your skills and learn new things, they’ll always be steps in the right direction. As always, if you have any questions about anything we’ve covered on this, or any blog, please feel free to give us a call or shoot us an e-mail! Very informative, a clear and easy understanding of maintaining your certification.